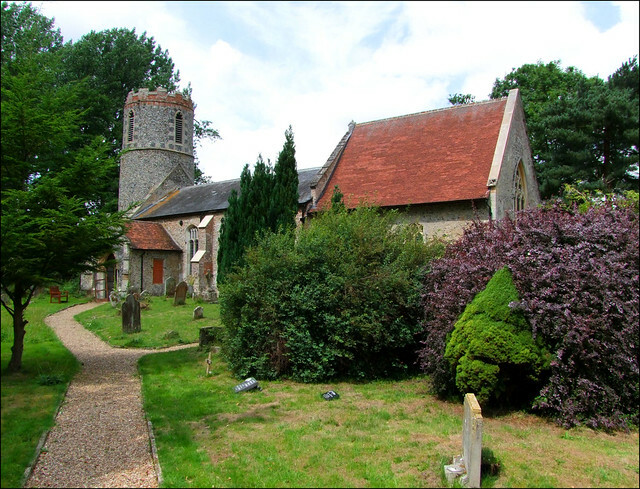 If it were not for something that happened in this little church, it is possible that there would be no medieval parish churches in England worth visiting today. For here it was that Earl Bigod surrendered his loyalty to King Henry II in 1174, giving up his castles at Bungay and Framlingham as part of the price. The crown later awarded Framlingham to the Dukes of Norfolk, who championed the cause of Mary I in the 1550s, sheltering her at Framlingham until it was possible for her to become Queen. Thus, Lady Jane Grey did not achieve the throne and finish off the destruction of churches begun by the vileadvisors to her cousin Edward VI. If this had happened, there would be no rood screens, no wall paintings, no stained glass; more to the point, probably no Church of England. A cross memorial up by the road reminds us of that important event. It is hard to imagine anything dramatic happening here now in this exquisitely pretty little spot. You go down a track from the quiet village road, and the church sits beside the River Waveney, a field of cows separating it from water and Norfolk. The larger village of Brockdish is across an old bridge from here, but the only sound was of bird song, and the light wind in the trees, and the occasional restless moo from a cow. It was just about perfect. Although we were a little way from the river itself, the ground felt boggy underfoot, and the church must actually be built in the Waveney's flood plain. The little graveyard has a number of interesting headstones from down the centuries. The round tower of the church is much restored, but very pretty with its flushwork and brick battlements. The most striking thing about the exterior is how much higher the chancel is than the nave, an awkwardness which is most dramatic, and not a little pleasing. Syleham's is perhaps not the most exciting of church interiors, but it is pleasant and peaceful, quite in keeping with the setting outside. Inside, the church is essentially Victorian, but a surviving curiosity is the rather extraordinary font. It appears to be a rustic 14th Centry piece on the base of an earlier Norman one. Topped off with a charming and presumably local late 17th century cover, it is an enchanting and idiosyncratic feature. Two later brass inscriptions survive, and the chancel is watched over by a sombre early 20th Century Christ Crucified. This is rather good, and would probably be lost in a larger place. Similarly, the early 19th century memorials either side of the east window seem much grander and more imposing than they might elsewhere. Early readers of this site might be forgiven for thinking that this church was an unwelcoming place, but now nothing could be further from the truth. St Margaret is militantly open everyday to pilgrims and strangers, the wooden outer door removed and the inner door wedged open. And, aside from the historical significance of the place, it's lovely.